We explore the principles of biology by harnessing the power of physics, mathematics, chemistry and computer science. 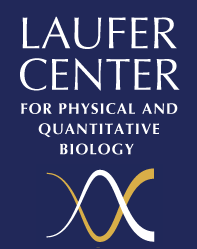 For the individual research interests of the 16 faculty groups in the Laufer Center, click here. In addition, we have two areas of core collaborative research. Coutsias, Green, Rizzo, Wang, Kozakov, MacCarthy, Schatz, Seeliger, Skiena, Simmerling and Dill develop theory, models and simulations to understand mechanisms of biological molecules and cells. A key challenge in computational biology is to comprehend large actions and large proteins. Progress is currently limited by physical forcefields, solvent models, and by conformational searching and sampling. In core activities, we are improving the physical, mathematical and chemical bases of models, to enable a deeper understanding of protein folding, ligand binding, protein-protein interactions, and large mechanistic actions of large biomolecules. Balazsi, Levy, Rest, Futcher, MacCarthy, Wang, Schatz, Studier and Dill aim to understand the dynamical processes of cellular evolution, through experiments and theory. The evolution of cells is important for how life emerged and continues to change, as well as for combating maladies of evolution, such as cancer and drug-resistant organisms. Our goals are to understand how genomes evolve, how the variations among cells are propagated, the nature of a cell's fitness and robustness, and how these properties are encoded in biochemical and regulatory networks.